Luke Campbell's class shone through as he beat fellow Hull fighter Tommy Coyle in front of his home crowd to win the WBC lightweight title eliminator. Olympic champion Campbell stopped Coyle in the 10th, with his opponent having faced three counts during the round. 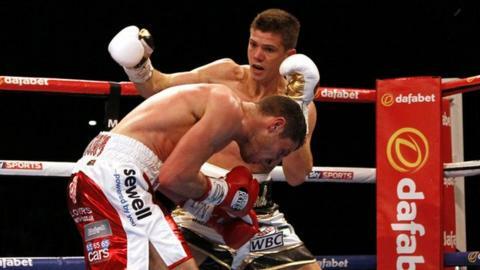 Coyle, 25, also hit the canvas in the second round as Campbell targeted him with ferocious body shots. "I knew I was in for a great fight. I just wanted to show everyone what I can do," said 27-year-old Campbell. Meanwhile, former WBO super-featherweight and lightweight champion Ricky Burns, 32, defeated Prince Ofotsu by a technical knockout in the fifth round, after the Ghanaian's corner threw in the towel. Unbeaten Dillian Whyte (15-0) proved he could be a tough opponent for fellow British heavyweight Anthony Joshua, with a first-round victory over Irineu Costa. The Brazilian twice hit the canvas before the referee halted the fight. Joshua, 25, is undefeated in 13 fights since turning professional after winning Olympic gold in 2012. Promoter Eddie Hearn said the pair could face each other later in the year. The other key contest on the undercard saw light-middleweight Brian Rose of Blackpool defeat American fighter Carson Jones on points, following an epic and bloody encounter. The Oklahoma man stopped the 30-year-old inside a round in February, but the Briton got his revenge on Saturday night.